My research focuses on an unrealistic theory called massless super Yang-Mills (SYM). This sounds pretty pointless, at least at first. But actually this model shares many features with more complete accounts of reality. So it’s not all pie in the sky. The reason I look at SYM is because it contains lots of symmetry. This simplifies matters a lot. Studying SYM is like going to an adventure playground – you can still have great fun climbing and jumping, but it’s a lot safer than roaming out into a nearby forest. Famously SYM has a conformal symmetry. Roughly speaking, this means that the theory looks the same at every length scale. (Whether conformal symmetry is equivalent to scale invariance is a hot topic, in fact)! Put another way, SYM has no real notion of length. I told you it was unrealistic. This is a bit unfortunate for me, because I’d like to use SYM to think about particle scattering. To understand the problem, you need to know what I want to calculate. The official name for this quantity is the S-matrix. The jargon is quite straightforward. “S” just stands for scattering. The “matrix” part tells you that this quantity encodes many possible scattering outcomes. To get an S-matrix, you have to assume you scatter particles from far away. That’s certainly the case in big particle accelerators – the LHC is huge compared to a proton! But remember I said that SYM doesn’t have a length scale. So really you can’t get an S-matrix. And without an S-matrix, you can’t say anything about particle scattering. Things aren’t looking good. Fortunately all is not lost. You can try to define an S-matrix using the usual techniques that worked in normal theories. All the calculations go through fine, unless there are any low energy particles around. Any of these so-called soft particles will cause your S-matrix to blow up to infinity! But hey, we should expect our S-matrix to be badly behaved. After all, we’ve chosen a theory without a sense of scale! These irritating infinities go by the name of infrared divergences. Thankfully there’s a systematic way of eliminating them. Remember that I said our SYM theory is massless. All the particles are like photons, constantly whizzing about that the speed of light. If you were a photon, life would be very dull. That’s because you’d move so fast through space you couldn’t move through time. This means that essentially our massless particles have no way of knowing about distances. Viewed from this perspective it’s intuitive that this lack of mass yields the conformal symmetry. We can remove the troublesome divergences by destroying the conformal symmetry. We do this in a controlled way by giving some particles a small mass. 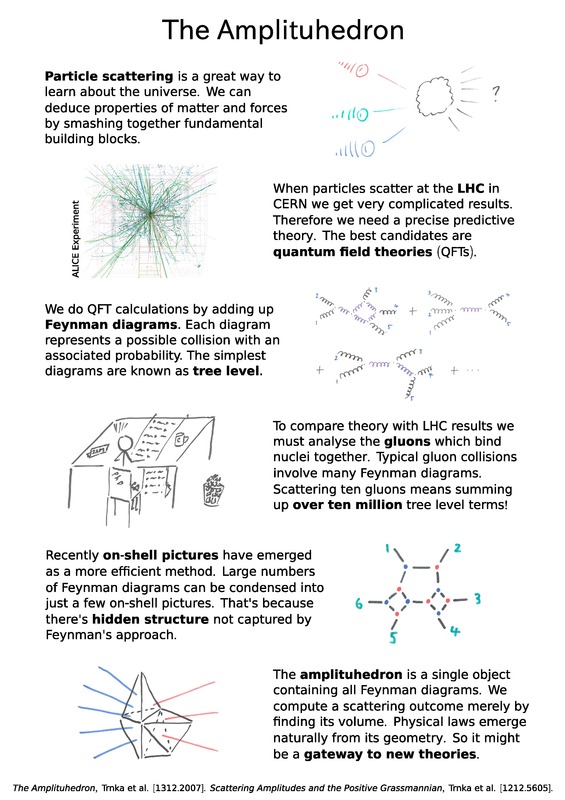 Technically our theory is now called Coulomb branch SYM. Who’s Coulomb, I hear you cry? He’s the bloke who developed electrostatics 250 years ago. And why’s he cropped up now? Because when we dispense with conformal symmetry, we’re left with some symmetries that match those of electromagnetism. In Coulomb branch SYM it’s perfectly fine to define an S-matrix! You get sensible answers from all your calculations. Now imagine we try to recover our original theory by decreasing all masses to zero. Looking closely at the S-matrix, we see it split into two pieces – finite and infinite. Just ignore the infinite bit, and you’ve managed to extract useful scattering data for the original conformal theory! You might think I’m a bit blasé in throwing away these divergences. But this is actually well-motivated physically. The reason is that such infinities cancel in any measurable quantity. You could say that they only appear in the first place because you’re doing the wrong sum! This perspective has been formalized for the realistic theories as the KLN theorem. It may even be possible to get a rigorous version for our beloved massless SYM. So next time somebody tells you that you can’t do scattering in a conformal theory, you can explain why they’re wrong! Okay, I grant you, that’s an unlikely pub conversation. But stranger things have happened. And if you’re planning to grab a pint soon, make it a scientific one! Excellent article uncovering the problems of journal subscription. I’ll try chatting to the relevant people here at QMUL and see whether I can dig deeper into the legal implications threatened by Elsevier. Will let you know what I find. The Amplituhedron – Now In Poster Form! Recently there’s been a lot of excitement about the amplituhedron. This wacky new object might just revolutionize our understanding of particle scattering. To help you get your head round it, here’s a poster I made for an outreach competition. Click for the full size JPEG file. If you want a hard copy to impress your friends at home, just drop me a comment! I’ve got a few spares, which I’ll happily put in the mail. By the way, check out The Naked Scientists podcasts – great info and entertainment for the daily commute! So you want to become a physicist, right? Problem is you don’t know much physics. Maybe you did some in high school. You might even have read a few physics blogs. But despite your enthusiasm, the road to the research frontier looks perilously long! But I reckon it can be hiked in less than a year, just by dedicating a few hours of your weekend. Thanks to the sterling work of Leonard Susskind, anybody can now learn enough physics to dive straight into research. In a series of video courses he explains the theoretical minimum you need to dive into modern research. There’s even an accompanying set of popular science books. So challenge yourself to cover each of his core courses in a month. If you watch a lecture every Saturday and Sunday you’d manage it, more or less! Supplement your viewing with some problem questions and you’ll be well on the way to a firm foundation in the laws of nature. Be warned – physics isn’t always easy to learn. Things can get tough, particularly when you’re studying on your own. But with the power of the internet, help is never far away. I suggest you hang out at Physics StackExchange. Asking and answering questions is the lifeblood of research culture, so don’t be shy! Once you’ve burned through the core courses it’s time to step up a gear. Take a look at Susskind’s advanced courses. Although these are harder, there also infinitely more exciting! Plus, you can just pick and choose the ones you want to. Few research physicists start out with a encyclopaedic knowledge of every area. If you keep up your twice a week lecture strategy, you’ll be equipped with the theoretical minimum within 9 months. Novice to expert in less time than it takes to train for a marathon! Sounds pretty good to me. There’s one final step – read real life papers. This is pretty scary at first, so I usually start by browsing the introduction and conclusion. Once you’ve done this a few times you can take a deep breath and dive in properly. Remember to have a pen and paper handy – you’ll only learn by actively working out what’s going on! Where to start? I think you could do worse than tackling the top 40 most cited papers of all time. Okay, this list is biased towards high-energy theory. But between you and me, that’s the coolest part of physics anyway! Three months of reading real papers won’t give you enough time to get through all 40! But even if you just browse two or three, you’ll still be intellectually fraternising with the greatest academics of our generation. Your journey from layman to physicist will be complete. So get inspired and give this project a go! I’ll be fascinated to hear from anybody who tries out some new physics, whether it’s for 24 hours or a whole year. I firmly believe that science should be available to everyone. Now more than ever before that opportunity is open to you!